NEW YORK, NY (May 6, 2009) – “The 34th Annual One Show” announced the winners of the Gold, Silver and Bronze Pencils at the Frederick P. Rose Hall at Jazz at Lincoln Center this evening. Widely regarded as the advertising industry’s equivalent to the Oscars®, The One Show honored the year’s finest achievements in print, television, radio, outdoor, innovative marketing, integrated branding and branded content. More than 600 advertising professionals and New York VIPs gathered to celebrate the winners at the gala event produced by The One Club, the world's foremost non-profit organization dedicated to recognizing excellence in advertising and design. The One Club for Art and Copy is the world's foremost non-profit organization dedicated to promoting the craft of advertising. Founded in 1975, The One Club has approximately 1,000 members, including copywriters and art directors. As part of its mission to promote high standards of creative excellence, The One Club produces the advertising industry's most prestigious awards program, the One Show. 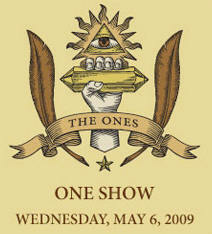 The coveted One Show "Gold Pencils" are regarded as the zenith of achievement in the advertising world. 1998 marked the inauguration of One Show Interactive, a live awards program designed exclusively for the new media community. The One Club regularly produces a variety of events and materials that encourage aspiring advertising executives to hone their craft. In 1995, The One Club established an education department, dedicated to fostering the creative talents of advertising students nationwide. The department administers scholarships to outstanding students in advertising programs at a variety of advertising schools across the country.